Inspired by the opening scenes in the Avengers: Age of Ultron movie when the Avengers assault the Sokovian Hydra base, this premium motion statue is an original composition conceived by the Factory Entertainment creative team and sculpted by Patricio Lopez! Cap has been seen riding several motorcycles over the decades, and he is captured here charging into battle on a menacing looking black "streetfighter-style" ride. It features a hidden central mounting simulating the bike rearing up onto its back tire, making a heroic leap into action. Crafted in heavyweight polystone and hand-painted it stands 15-inches tall and features an integral shield design display stand! 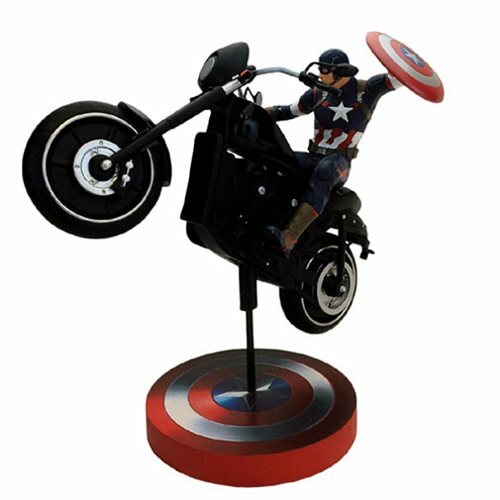 Captain America Rides is a numbered, limited edition and is supplied in full color presentation box with a certificate of authenticity. Ages 13 and up.